I so crave to be real. To show you my heart and be vulnerable...even at the cost of my pride and espect. How can I expect you to trust me without sharing me...all of me. The idea behind this blog means nothing without sharing my experiences. Especially if they are horrible ones. Several months ago, a precious post from a beautiful friend of mine inspired me. Her thoughts on "No More Apologies" and embracing who we are, the good, the bad, the ugly...are so important and essential to life. In a different way...I want to share the way I have embraced who I am. Embraced with open arms my past, because it made me more compassionate and so much stronger. At the risk of being vulnerable...and laying my heart on the line, I want to share this with you...a few thoughts on my depression. The picture above was taken several years ago now, right at the peek of my depression. 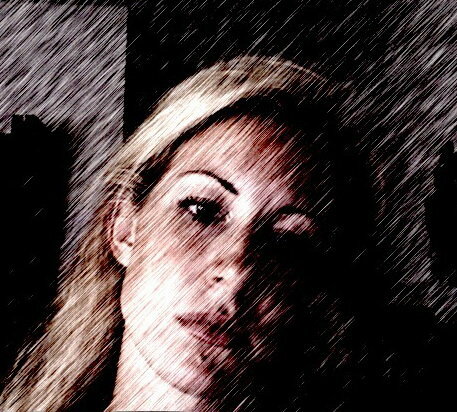 It was one of the first iphotobooth pictures I took on my new computer. Looking back now, its hard not to notice the deep sadness in my eyes and its interesting to me that out of all the options, the graphic effect I chose at the time somewhat resembles rain pouring over me. It didn't happen over night. It was a gradual process...downgrading myself daily. Telling myself that I had no worth. I wasn't good enough. It was my Junior year of college. I had just transferred from one University to another. The friends I had made at my previous school were priceless. I had never met such an extraordinary group of women in my entire life. Precious. I transferred to be closer to home and because my degree goals had changed. Being pretty adaptable, I thought that instantly I would connect and feel right at home. However, for the first time in my life, I didn't. I wanted to give up before I even started and this terrified me. What had happened to the soul I once had to keep striving, regardless of my surroundings? I came from a wonderful dream-filled childhood and a very positive high school experience. Sports, music, art, friends, family, faith...they were all there and I loved each part! Now, I was a very small fish in a huge pond and I didn't know who I was anymore. My faith was still there. I prayed daily, but my self-worth had plummeted as no one knew me and I felt I had nothing to offer. It didnt matter that I had a family that loved and supported me my entire life. It didnt matter that I had succeeded in my past. I began to not like who I was becoming and that horrible grip of depression made me someone I no longer recognized. Along with that, the daily pressure of choosing a major weighed on me heavily. I called my mother sobbing on a regular basis. It was awful. Every single day was a struggle to get out of bed. couldn't eat much for days...then I would eat too much and get sick. My weight went down to 108 lbs, which wasn't healthy on my 5'8" frame. I was physically and emotionally not well. When I got home from class, it was 4pm and since it was already dark outside during those long winter months...I craved going to bed before dinner...to hide...to curl up and dream and not face another one of my dark thoughts. One day, my sweet, life-long and one of my dearest friends Nicole (read her story here) encouraged me one morning to sign up for the Passion Conference in Nashville, TN. I won't get into great detail, but this meeting served as a revival of my soul. Praise God for incredible friends and Nicole's encouragement. I also praise God for one of the speakers there--Beth Moore. Her infectious energy and unabashed faith sparked within me new life. On my trip home I journaled, prayed and was energized to start new. I got home, poured my heart out to my family, these secrets I had been holding in for so, so long. I began to see myself not for my works. Not for what I could or couldn't do, but for being WHOLE in Christ. After all, if it took me that long to fall into this pit, it would take me just as long...(if not longer) to get out! I am writing, not to force my beliefs upon you. I am writing because this is my story of how I have been healed. I share, not for sympathy. I share because I know I am not alone in my suffering and I would HATE for you to feel alone in yours. I lived with the false belief for far too long that it meant you were "weak" if you asked for help. If you couldn't figure it all out on your own. Now I know all too well that I am only the weakest when I am not able to face my problems, my sorrows and my hurts. When I am not able to humble myself to ask for help. "I hope you never have to see a counselor. Only the crazy ones do that." I wanted to take her in my arms, squeeze her and say, "Its okay to struggle. We all do! And when that happens...its so important, so imperative to ask for help!!" All that to say, I am here. If you hurt, I know your hurt. If you are scared, I know your fear. I dont have all the answers. I still struggle, but I have been set free from this evil grip of depression. He saved me once again. If you can relate to this...my heart is here for you if you want it. I want to see you bloom! I want to see you flourish! I crave to see you live life full! Be YOU. Embrace YOU. Love YOU.